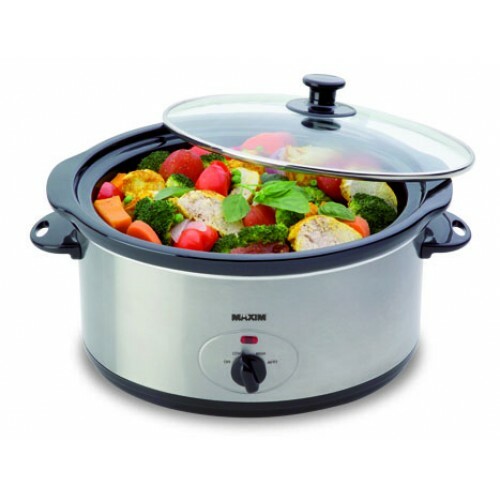 The Maxim 5 litre slow cooker is a fantastic way to cooke meals for the entire family. Slow cooking is a healthier way to cook as it retains nutrients and flavour as it cooks. Less expensive cuts of meat become juicy and tender and soups or stews taste delicious. Preparing a hearty and wholesome meal for the whole family has never been easier. Place the ingredients of your favourite recipe into the large 5 litre capacity cooker, set the timer for the appropriate cooking length and then come home to a beautiful meal hot and ready to eat. Cook for up to 12 Hours on Lowest Setting. Removable Ceramic Bowl with Tempered Glass Lid, can be used for serving to table. Less Expensive Cuts of Meat become tender and flavoursome. Cooker Dismantles for Easy Cleaning.